1932! The world is fascinated by growing rumors of hidden creatures that roam America. Popular tabloids are desperate for photographs of these mysterious beasts to prove the myths and sell tabloids. That's where you come in: As a freelance photographer looking to make a name for yourself, you must follow tips that have you scouring the country hoping to snap the pictures the tabloids desire. When your deadline arrives, you will sell your portfolio to score big! Now grab your camera and field notes, stay one step ahead of your rivals, and race to a photo finish as the greatest shuttergug of all time! 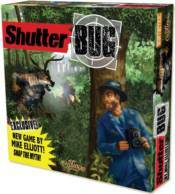 ShutterBug is a fast-paced set collection game of opportunity and exploration for 2-6 players, played in eight rounds. Each turn, players move their pawn across a map of America, gathering tip cards and racing to specific spaces to take pictures of astounding mythical creatures. Trading tips with other players to build their portfolio of fantastic creature photos, players strive to earn points for fulfilling their secret assignment and actively completing side jobs. Every turn counts, and every photo gets players closer to their goals. The player with the most points at the end of the game wins!